A governorship Aspirant in Kwara State and Former Federal lawmaker, Hon. Moshood Mustapha has denied instigating the Inspector General of Police against the Senate President, Dr. Bukola Saraki. Hon. 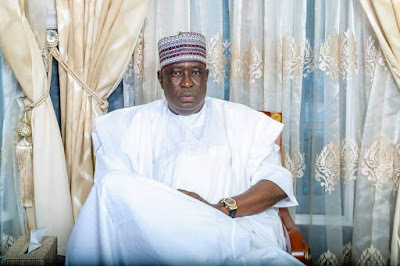 Mustapha, a former Special Adviser to Senate President on Special Duties in a statement made available to newsmen on Friday said his recent visit to IGP, Ibrahim Idris was for personal reasons. My attention has been drawn to the rumor going round that I am the brain behind the IGP vs Saraki saga. Therefore, I find it expedient to lay the matter to rest once and for all. Firstly, I want to state that the accusation is unfounded, baseless, untrue and an attempt to malign my person and that is totally unacceptable. I am a very upright and principled person and its not in my nature to bring down others for self-aggrandizement. Secondly, the relationship between Sen. (Dr.) Bukola Saraki and I have spanned several years and he is someone I hold in high regard despite the fact that we are presently on different political wavelength. Therefore, I will never do anything to instigate people against him and I am sure he is aware of this fact. Thirdly, the Senate president does not have any criminal record that I know of and he never indulged in any criminality throughout the period I worked with him, so, why will I meet with the IG to indict him? I will advise the detractors to count me out of this issue and take caution with the way they politicize a complex security issue such as this. For the records, my visit to the Police Headquarters was to meet some friends who were colleagues during my days in Immigrations on no occasion did we mention the Senate President’s name during our meeting. I am a social networker and I maintain a cordial relationship with everyone across all spectrum but that does not imply that I will use my connection to tarnish someone's image. The issue between the IGP and the Senate President who is the number three citizen of Nigeria, is quiet unfortunate and it shouldn’t have degenerated to this level. But I am confident that everything will be resolved amicably and everyone responsible for the attack that led to the loss of lives in Offa will be dealt with accordingly. I sympathise with the Family of the dead and pray that God grant the deceased eternal rest. Since the news of my gubernatorial ambition filtered into public domain, I have been a victim of series of personality attacks but I remain undeterred because I know its normal, especially, for someone vying for the position of the number one citizen of Kwara state. Nevertheless, my level of endurance has its limit; I will not condone any attempt to link me with an issue I know nothing about. I challenge anyone with proof of my involvement to come out with evidence. My gubernatorial ambition is geared towards delivering the dividends of democracy to Kwarans and I want to focus on that goal without all these unnecessary distractions.